Sometimes I feel like I give away 4 and 5 stars too easily, and that people won’t take my reviews seriously (ha) if I mark every book a 4-5 star book. I don’t think I do, but sometimes I feel like I give them away too easily. Here are a few factors in which I am more likely to give a higher rating: how quick do I read the book? when I am not reading it, do I think about it? Are the characters ones that I can fall in love with/relate to/want to love/want to hate/personable/flawed? Level of creativity? Something that has been done over and over again? Etc. These are very important aspects to me. Recently, I feel like I have been reading more fairy tale re-tellings. Some of which have hit the mark and made me excited and feel good, while others have just failed miserably leaving me needing more. Beastly made me feel good. 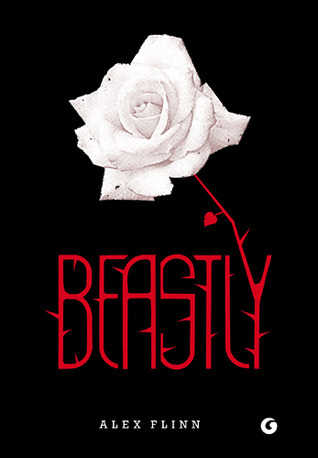 It is your typical Beauty and the Beast story, beautiful, cocky arrogant boy, is mean and hateful to everyone, pisses off the wrong girl one day, a girl who also happens to be a witch, puts spell on boy and turns him into a beast with the stipulation that should he fall in love and receive true love’s kiss, then spell would be broken. Beastly stuck pretty close to the original origins of the story, but modernized it and relocated the story to good old New York City (where seeing beastly sights is not unheard of). Beastly keeps to the original message, but keeps it relatable. I think at some point in time we have all met that boy just like Kyle/Adrian who thought they owned the world and could do what they want to whomever they wanted regardless of consequence because of how he looked. We know girls like that as well. And we (if you were anything like me) would always tell ourselves, one day they wouldn’t have beauty anymore. That when the wrinkles came, and the skin sag, what would they have left? I love how Alex Flinn teaches Kyle/Adrian this message. Which, without giving any spoilers, I never saw coming, even with the subtle hints in the book that now makes me think why I didn’t think harder on that prior to the end of the story. This story made me feel good. When I wasn’t reading it, I was thinking about reading it. Not necessarily how it would end, or what would happen next, because, if it was anything like the original tale, I knew how it would end. That didn’t spoil it for me, because the enjoyment came out of how Kyle/Adrian transformed into someone much better. How he came to appreciate life and those around him, when he no longer had a life and was forced to take a better look at what he did have, and how to appreciate it. I can appreciate how Flinn made Kyle/Adrian vulnerable (I refer to him as Kyle/Adrian because he changes his name to Adrian. He felt like Kyle was a negative name, which meant beauty, that held on to who he was previously and not who he was now, or who he was becoming. I think Lindy carried herself rather well. If I had a father that was always looking for his next fix to the point that he willingly gave me to a monster just to get out of trouble when he got caught stealing, I don’t know if I could have or would have handled myself in the way she did. Bully for her. I was glad it was Lindy who became the true love. I guess I should have paid more attention at the beginning of the book, there was so much foreshadowing! Sure, I am not a complete dope, I knew eventually, but I wasn’t sure it was going to be her at the time, until the father broke into Kyle/Adrian’s home. I am torn between 3.5 and 4, because, even though I read it in less than a day, and it meets all my criteria, I still feel in some ways it fell short. I still wish maybe there was some twists in the story that would differentiate it between the original story making it more creative. It was still a good book, and I hope to obtain the movie in the near future so I can compare some more. Previous Article You can Rule me any day!